Love making ice cream, but don't have a place to store that homemade goodness? This 24 pack of 1 pint storage tubs will be a nice addition to the collection. Freeze what you don't eat. 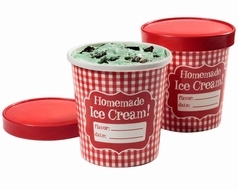 Up to 1 Pint can fit in each tub for homemade ice cream, frozen yogurt, sherbet, sorbet or custard.